Pump-out and Storage for R12, R22, R134a, R407c, R500, R502, etc. 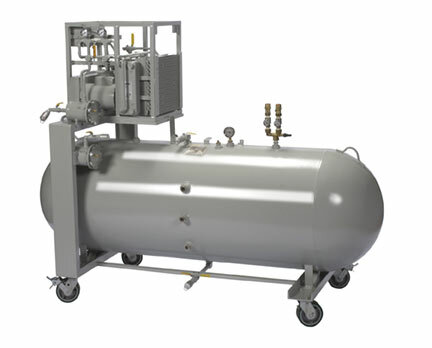 Lite Evac unit is integrated with a 250 or 500 gallon ASME tank for total pumpout & storage capability. Larger and smaller tanks available. Services R12, R22, R500, R502, R134a, MP39, R409a, R507 and other high pressure refrigerants & blends. (LxWxH) 120-gal: 85.5" x 38" x 54"
250-gal: 94" x 38" x 66"
500-gal: 113" x 45" x 73"